Photograph depicts what was believed to be a lumber loading spur. 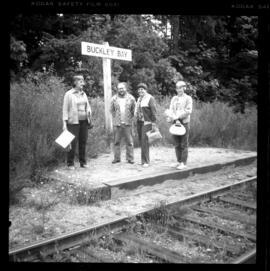 Photograph depicts the Buckley Bay halt or flag stop on approximately mile 126. VIA Rail daily train was departing south. This flag stop was located between Dunsmuir and Victoria. Photograph depicts the Buckley Bay flag stop on mile 126. 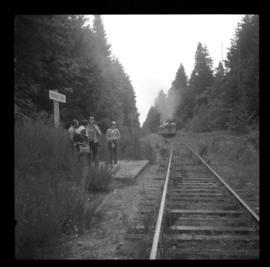 Image displays a daily pass train with 2 Budd cars picking up speed. It was travelling south. Photograph depicts the Buckley Bay flag stop on mile 126. Jan and Susan Davies are seen on the extreme left and right. 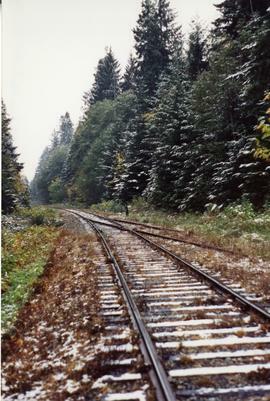 This location allows passengers access to the ferry to Denman and Hornby Islands. 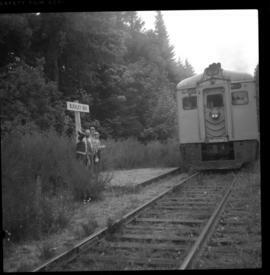 Photograph depicts a 2 car Budd train (#6133 and #61340) approaching the Buckley Bay flag stop on mile 126. 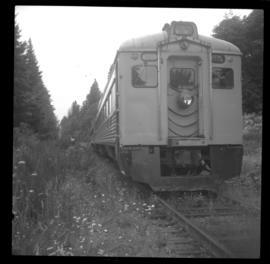 The train is travelling to the north while the camera is aimed towards the south.